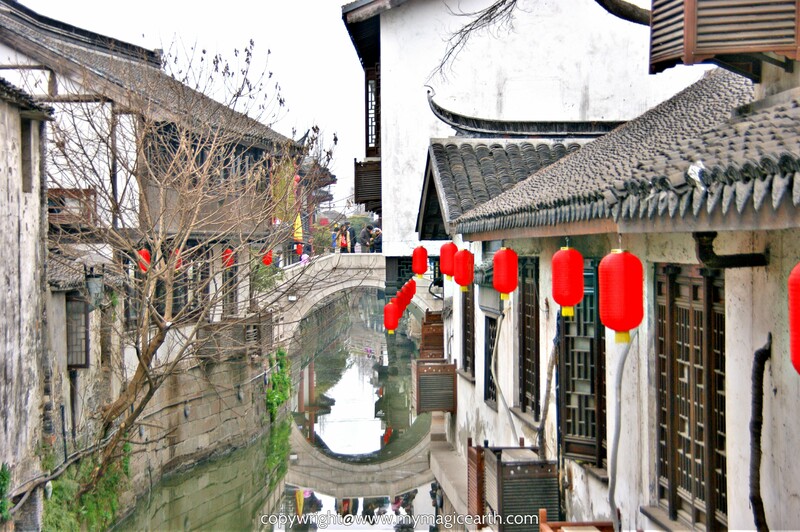 Situated 48 kilometers away from Shanghai, Zhujiajiao (朱家角) is a typical ancient water town on the outskirts of Shanghai. It was established during Song dynasty. Later in Qing Dynasty Zhujiajiao became a trading center in the area. Due to its favorable natural environment and convenient transportation infrastructure, lots of merchants gathered there and developed the cloth industry since then. Over the time Zhujiajiao prospered through clothing and rice businesses. Many other industries like handicraft also developed there earlier than in other areas of China. Wine shops and tea houses were open day and night and many merchants even came from other places to the market. In the late of the Qing dynasty, it became the first business town and a famous merchant hub for agricultural products among the surrounding towns. Today this is a popular destination for the locals. Since Shanghai Metro line 17 connects the town to the Shanghai city centre, travel there becomes much easier and less time consuming. It becomes one the top day trip destination from Shanghai. Zhujiaojiao is also called the “Venice of Shanghai”. 36 stone bridges cross numerous rivers and canals. Among those bridges Fangsheng Bridge (放生桥 ) is the longest, largest and tallest stone bridge in the area. Four lively stone lions stand on top of it. Another one worth to mention is the Lang Bridge (Veranda Bridge, 廊桥). It is the only wooden bridge. 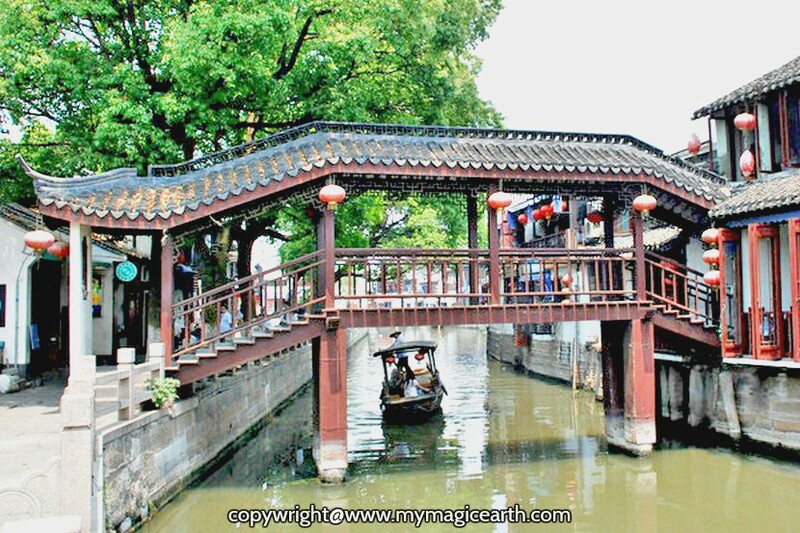 It has wooden bars on the two sides and eaves above, just like a narrow corridor cross the canal. Along the North Street many ancient buildings from the Ming and Qing Dynasties attract great numbers of domestic and foreign visitors. Merely one kilo metre long, the street is less complex, yet very elegant. Plenty of restaurants, bars and coffee shops line both sides of the narrow street. You can stroll along the street to see the ancient buildings, sample some local snacks or relax in bar. There are 9 old streets in this style. Walking on the zigzag stone pathway and the winding long lanes can easily take hours. Among the ancient architectures, Kezhi Garden is the largest garden. It consists of a main hall, a garden, and an artificial hill. The landmark of the gardens is a five story building with a pavilion on its roof. It is the tallest structure in Zhujiajiao old quarter. The other sight in the garden is the Yin(阴) and Yang(阳) corridors. In ancient time man should walk on Yang corridor and women should walk on Yin corridor. In the area of Fangshengqiao and North Street there are many tea houses in different styles. Some tea houses are quite simple, a few tables with several benches. There are also tea house on boats. Customers can watch TVs, play Pokers or Chess with each other. Various snacks are also provided to their guests. Enjoy tea and eat snacks while watching bridge views and water scenes, you can have a really good relax there. This post office is located on Xihu Street (西湖路 35号). There are many old narrow lanes in the town. Walk though the lanes you could also spot part of the local lives. From the narrow lanes you can have a different angle to picture street scenes. The scenic spots outlined here are just a selection of the pretty water town. You don’t need a ticket to walk around. But some attractions and buildings require a ticket. Tickets are available at the main gate. Since 2012, a large-scale shopping mall and entertainment complex has been built in the ancient Town. The over development is taking away the history and threatening the water town’s authenticity. Nevertheless tourists can still stroll around to see this historical ancient water town while in the meantime enjoy shopping at those modern shopping and entertainment complexes. Take Shanghai Metro Line 17 and get off at Zhujiajiao Station directly. Take the following bus routes and get off at Zhujiajiao Bus Station first. Then walk west around 0.6 miles to arrive at the scenic area: Huzhu Express line, at Pu An Road/ East Yan An Road (普安路/延安路), Shangzhu (上朱线) Line at shanghai south Railway Station or Zhuxu Line (朱徐线) at East Xujing (徐径东) Subway Station to get to Zhujiajiao.